Now, I’ll admit I’m a sucker for kids movies, if they’re well done. But this one I’d rank among my top ten, easily! Ralph is a bad guy who is tired of being bad. He goes to bad guy support group and everything (seriously, so many clever things like that in this movie!) So, in order to get the rest of the citizens of his game to like him, he game jumps in an attempt to become a hero. Unfortunately everything goes wrong, and it’s not long before Ralph is convinced he’s to blame. 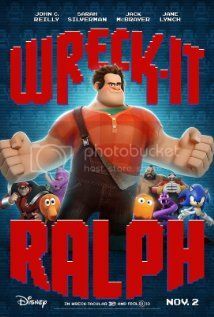 One of the reasons Wreck-it Ralph works so well is the many layers of story. Each character is well-rounded and has their own back story that really influences who they are. Even some of the side characters whose back-stories are never told are complexly imagined – I wouldn’t be surprised if we see spin-offs or even sequels featuring some of the minor characters. A nicely layered story also leads to layered messages. All of the characters are flawed somehow which is definitely important. But also, not one of them has the “answer.” All of them have lessons to learn on prejudice, bullying and helpfulness. These lessons are tied together so smoothly that someone not looking might not even notice how good for you this movie is! Sadly, I don’t remember anything significant enough to comment on about the music (shame on me!) but this is definitely one I’d like to see again and again so maybe next time! 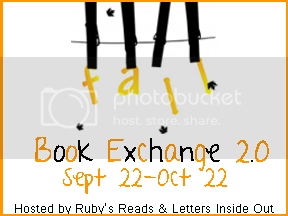 Fall Book Exchange: Thank you! A quick “Thank you” to Ricki, who was my Santa for the Ruby’s Reads Book Exchange this fall. She didn’t give me a blog address, so I can’t link her, but she seems really cool! I received Rebel Angels by Libba Bray, and A Discovery of Witches by Deborah Harkness, both of which I’m really excited about! Thank you so much Ricki! I would also like to thank our hosts Ruby and Amanda for doing a great job organizing the chaos! Monday for NanowriMondays I finally admitted defeat – the timing just wasn’t right this year. Wednesday I was thankful for everyone! This week was pretty emotionally taxing. We spent the week visiting my Grandparents for Thanksgiving and Grandpa’s not doing so good. It was difficult to say the least, to think that the next time we go over there will probably be for the funeral. Kristilyn (Reading in Winter) discussed being a book snob. Amanda (On a Book Bender) was thankful for her silent readers. Get my “Embarrassed I haven’t read yet” shelf under 45. Keep my to-read-now list as close to 250 as possible. Expert level: bring it down to 235. It’s that time of year again! Time for the more crazy among us to attempt to drive ourselves batshit insane! I mean… Time to write 50,000 words in 30 days! For the month of November I’ll be replacing my usual Media Monday posts with NanowriMondays (borrowed last year from Casey @ The Bookish Type, who sadly is no longer blogging). They’ll cover my progress, the frustrations and excitement, and some basics of the story I’m writing. I have bad news guys. I am failing at Nanowrimo. Like big time. I know I was almost caught up last week, but since then life got in the way. I have about a week to finish all of my applications, which means lots of writing for that – personal statements, revising papers for writing samples etc. I can’t afford to put my entire life on hold just to win at Nanowrimo, especially when I’ve done it once before. So, from today, I will officially no longer be participating. The plan is to continue my writing after all my applications are in. Thanks to everybody for your support! I wouldn’t have even made it as far as I did without your help! Monday for NanowriMondays I discussed how I write and discovered I write conversations best. 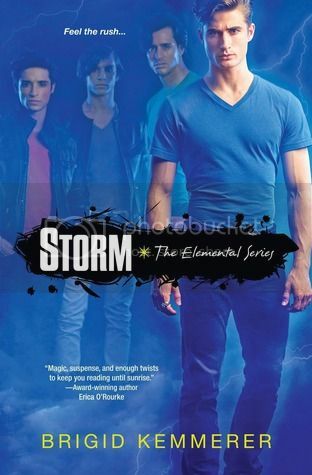 Tuesday I reviewed Storm by Brigid Kemmerer – Great elemental storyline but very definitely a YA PNR. 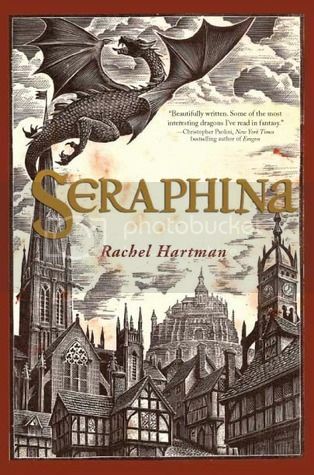 Thursday I reviewed Seraphina by Rachel Hartman – love me some dragons! Friday I discussed my difficulty writing reviews. How is it almost Thanksgiving already? HOW??? Right now I’m hanging out at one of my college friends’ house for the weekend. We haven’t seen each other since August, so it was definitely time. Yesterday we went to a HUGE Christmas craft show and I spent way more than I should have (but seriously, SUCH pretty jewelry). 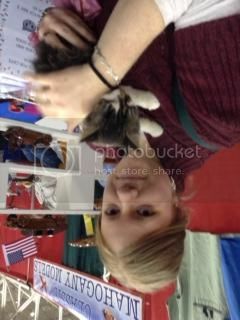 Oh and there were kittens and they let me HOLD ONE! Patti (Parajunkee’s View) complained about obscure music mentioned in books. I never really pay attention to be honest, but her thoughts are interesting. Kristilyn (A Winter Writer) reminded us that to get better at something we must do it (aka practice). Beth Revis (author of Across the Universe) gave us some insight into her writing process – specifically how she comes up with ideas. Danny (Bewitched Bookworms) discussed review requests, and what makes her accept some and reject others. Here on Creativity’s Corner, I like to do thing my own special ways. (I mean, don’t we all?) I may not have the biggest blog on the block but I love what I do have, because it is so me. I love interacting with all of you, because you’re all such special people and you make me see the world in new ways. But there’s one thing that I don’t particularly like about blogging, and it’s time for me to confess. I don’t like writing reviews. My mother always told me if I didn’t have anything nice to say, I shouldn’t say anything at all, right? So why do I feel the right to publish any negative opinions? Besides that, I hate making waves. I love discussions, but I don’t want to step on any toes! Add to that the fact that it really takes a lot to make me not like a book and I feel like I’m almost not qualified – everyone says they want a balance of reviews, both positive and negative, but I find it excessively difficult to write a negative review, because I just don’t want to. Sit down to write review – set up page, list characters for reminding myself, fiddle w/images etc. Not sure how to start but I’d better… OOOH SHINY! NEW BOOK! Finish second book. I feel guilty for not reviewing first book. So, I give myself a stern talking to before sitting down to write BOTH reviews. I got interrupted. I need portable entertainment for some reason, so I pick out another book, but promise myself that I will write the reviews BEFORE finishing yet another book. Oops. That book was exciting and now I’ve finished it without writing a single review. And repeat ad nauseum until I have so many reviews piled up that I can’t stand to even look at my review notebook because it isJUDGING ME! It’s an embarrassing and painful process. I’ve tried many methods to get myself out of the vicious cycle. Some of them work for a little while, but they all fail eventually. At this point, I’ve just resigned myself to the fact that I am a procrastinator through and through! Do you ever have trouble writing reviews? What tricks do you use to make sure you don’t get backed up on reviews? Honestly, between dragons, epic fantasy and court intrigues, if I hadn’t like this book I would have been a little worried there was something wrong with me! But it most definitely lived up to and even exceeded my expectations! I’ve lamented many times that there are so few dragons in fantasy right now, but the truth is they’re pretty difficult to write. They serve pretty well as a distant villain, since there’s all these stories of sacrificing maidens. But at the same time, dragons are famously sentient. Ms. Hartman does a good job of incorporating both sides of dragon nature. By making Seraphina only half dragon, she also makes the dragons much more relatable. It’s one of those ideas that is incredibly unique and yet so obvious I wonder why no one has ever tried it before. The other thing I loved about this one was the vibrant writing style – I really did feel like I was watching a movie instead of reading. I loved that Seraphina was a musician, and the descriptions of her music really brought it to life for me. I was able to vividly imagine the city and all the different types of dragons and half-dragons. I especially loved the little trinkets the lesser dragons made (I don’t remember what they were called, sorry!). And, of course, then there’s Lucien Kiggs. He is one of my favorite love interests that I’ve ever read. He is complex – compassionate but strictly responsible. He has a lot less prejudice than the rest of the characters (or at least it seems like he does). He’s happy to work with Seraphina until he finds out she lied to him, and he admires and respects her without seeming chauvinistically surprised about it. I can unreservedly say that this book has only my highest recommendation – easily one of the top 10 books I’ve read this year! Becca Chandler is suddenly getting all the guys; all the ones she doesn’t want, ever since her ex-boyfriend spread those lies about her. Then she saves Chris Merrick from a beating in the school parking lot. Chris is different. Way different: he can control water just like his brothers can control fire, wind, and earth. They’re powerful. Dangerous. Marked for death. This book (along with a few others – Obsidian comes to mind) seemed to be THE book of the summer this year. While I probably would have read it eventually anyway – who doesn’t like a good elemental story? – that certainly bumped it up my list a few notches. There were a few things I really loved about this one. The premise is kind of Tamora Pierce meets YA paranormal and I kind of liked that. Elementals are a rather unused and under-explored type of magic user and I love them all the more for that. I also really enjoyed Becca’s balance. She’s caring and sentimental but is also a little bit badass. She’s hurting from her past but eventually she finds the courage to face up to it and move on. She was almost too balanced to be realistic, but she’s so nice that you like her anyway. Despite its many good points there were still a few things that bugged me. For one, the love triangle felt a little contrived. I was never really convinced that Becca really liked either of the boys. I got the feeling that while she enjoyed the attention, she was more just along for the ride, and I half expected her to dump both of them and go after someone completely different. I have to say, I think I’ve read to many YA paranormal romances recently, because I saw the big surprising twist ending coming from a mile away. As much as I love trying to figure out what is going to happen as I read, I’m sometimes a little disappointed at how often I’m right. Overall I would say this is a fun (if thick) read. I will definitely be looking out for the next book – I’m curious to see how a change in narrator will affect the tone of the story. NanowriMondays 2: How do you write? How about you? Do you prefer writing conversation, or the descriptions in between?